The Cedar Glen Penthouse is located in beautiful Cedar Glen Condominiums just off Hwy 54 in Camdenton, MO. We love it here so much that we recently bought another condo, the Cedar Glen Lofthouse, property #1439904. Take a look! Cedar Glen is truly the best destination for playing at the lake on calm waters and having beautiful green space for double the family fun. There is easy access to golf, shopping and entertainment since we are directly off the highway. There are no curvy roads to this place! 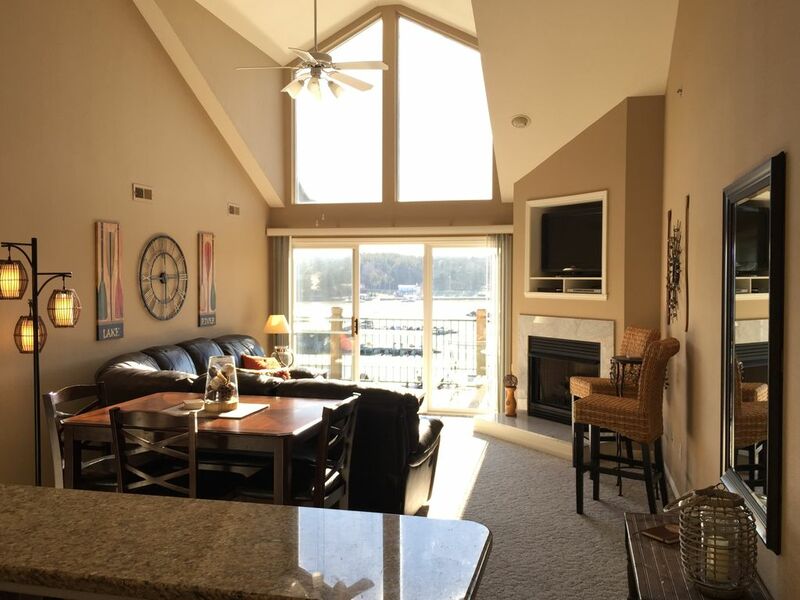 Our condo features high vaulted ceilings in all rooms, and the wall of windows in the living room offers a beautiful view of the lake, green space (a rarity for Lake of the Ozarks), and heated pool. Take it all in from the over sized deck that spans the width of the condo and is accessible from the living room and master suite. There are two full bathrooms, and both have plentiful towel bars, hooks and storage space for everyone. Whether your pleasure is swimming, boating, fishing, water-skiing, golfing, hiking, outlet shopping or just sitting out on the deck enjoying a tranquil view of the lake, we have the perfect accommodations for your group. Our Cedar Glen Penthouse is located on a quiet stretch of lake at the 13MM of the Big Niangua arm. The property features two large swimming pools, kid's playground, horseshoes, sand volleyball, and beautifully landscaped grounds. Thank you for looking, and we hope to book your stay with us soon. NOTE: There is an on-site boat ramp and an available 12' x 30' boat slip for $15 a day. It rents out first-come-first-serve, so please inquire if interested. Boat trailers parked on the property also require a parking tag for $3/day or $10/week. Hello! We're Eric, Carey, Hannah and Cody and we purchased this condo a few years ago! Eric and I are both high school teachers in the St. Louis area, and we'd dreamed of owning a place at the lake for over a decade. We are so excited to be making that dream a reality and we look forward to sharing our lake home with you. One of the things we fell in love with about Cedar Glen is the green space. It's a rare find at the Lake of the Ozarks to have both beautiful lake views and a gently sloping lawn to the water's edge. Cedar Glen offers both! We also fell in love with the amenities of this property. The on-site boat launch and trailer parking are wonderful for fishers and boaters; the proximity to golfing is great for those who like to hit the crooked sticks, and the easy access to Hwy 54 is amazing (especially if you want to find some bargains at the outlet mall in Osage Beach!) There are no tight, curvy roads to this place! The lawn is well maintained, and the pools are beautiful...and the one closest to our unit is heated! We love Cedar Glen, and hope you enjoy it, too. Come see it, and we're sure you'll want to come back again and again. We love this part of the lake because it is one of the few places where the water remains relatively calm and uncluttered from the big boats commonly seen further up the lake. You can enjoy water sports at all times of the day and week, hikes in nearby Ha Ha Tonka State Park, golf, shopping and lots of sun and swimming. We are literally minutes from the stores and restaurants in Camdenton, and only a short drive to Osage Beach (15 minutes) for additional shopping, dining, and leisure activities. At the end of the day, kick back, relax, and take in some quality time with your family and friends! toilet, combination tub/shower, Plenty of storage space, towel bars, and hooks for everyone! Enjoy the beautiful views from our lakefront property. Fish from the shoreline, take a walk along the winding sidewalk and enjoy the green space with your family. Bed linens and bath towels are provided; guests provide beach towels. 12-cup coffee maker equipped with filters. Updated kitchen with granite and new stainless appliances. Coffee maker/filters, blender, toaster, crockpot, and BBQ grill on the deck...Basically, everything you need to enjoy your stay. Bar-height table includes 3 chairs and a two-person bench. Comfortably sits 5 at the table and 3 at the bar. Pull up the bar stools and gather around the table for a family game night! Two large flat screen TVs; one in the living room, and one in the loft with a Nintendo GameCube system for some extra fun! We have several games to choose from in the loft. We have a wide variety of DVDs to choose from in the loft. It's hard to find a development with this much green space at the Lake. Well manicured, open grassy areas adjacent to the lake offer you the chance to get outside and play or take a walk. Large deck that spans the width of our condo. Two tables and 6 chairs to enjoy BBQ and relaxing. Offers a great view of the lake and the property. There are two courses within a stone's throw of our condo. Lake Valley Golf and Country Club is adjacent to the Cedar Glen entrance, and Old Kinderhook is directly across Hwy 54. There are two on-site pools available May - September; the one closest to our building is heated. It's also visible from our deck so older kids can enjoy a swim while you relax at the condo. Children's Playground, Horseshoe Pit, Sand Volleyball, Basketball Hoop; large open grassy areas for playing catch or other recreational activities between condo and lake. 12' x 30' Boat Slip may be available for $15 a day. It rents on a first-come-first-serve basis. Inquire if interested. Great views, great condo, great property managers! Perfect size and location to local family. A great Holiday weekend to remember. The condo worked so well for our family of 12. Thank you so much. The property was beautiful and very comfortable. It has a great view. The owner had great timely communication and was great to work with. 2nd stay...just like the first...great!!! 2nd year staying at this place. 4 guys came down to the lake for a golf tournament at Lake Valley. Perfect setup, as Lake Valley is a 1 minute drive across the street. Condo has everything you need. While it will sleep 8 comfortably (2 in the king, 1 each in the double beds) and 4 in the bunk beds, the living room is not really setup for that many people. I would recommend 6 people at the most (if adults). Camdenton is a 5 minute drive up Hwy 54. Osage Beach is about a 20 minute drive.